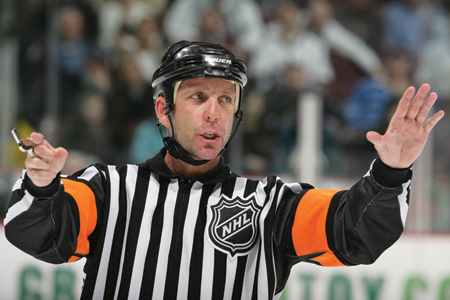 Hockey and Regulation Part I: Who’s a Better Referee, Bob Probert or a Referee? Backhand Shelf’s Daniel Wagner thinks it’s weird that Ralph Nader entered the public debate over fighting in hockey. He also thinks Nader’s open letter to Gary Bettman exposed Nader as a hockey know-nothing. He’s wrong on both accounts. On the latter point, Wagner employs an unspoken double standard to dismiss Nader’s argument. Although he only dismisses it half-heartedly, Wagner does successfully attack the multiple holes in Nader’s argument. But be that as it may, Wagner’s counterargument is trivial and incomplete, because he does nothing to attack the core of Nader’s argument, which is that if the NHL were serious about dealing with head injuries, it wouldn’t take risks with players’ health by allowing fighting, even if the risk involved there were slight. Instead of taking that argument head on, Wagner pokes insignificant holes in that argument, missing the woods for a couple trees. For instance, Wagner blames Nader for relying on “intuition” instead of “science.” Let’s stop and think about this for a second. Wagner’s claim is that there is no overwhelming scientific evidence that fighting causes brain injuries. Fair enough (Nader also notes this), but why is it necessary to unquestionably prove a link between fighting and brain injuries before arguing for a ban on fighting? Why is fighting innocent until proven guilty? The answer to that question leads us to the unspoken double standard Wagner, and many other fighting apologist (or half-apologists) employ. Wagner accuses Nader of using intuition instead of scientific evidence, but what is it that leads fighting defenders to believe fighting should have a place in the game? Scientific evidence? Right. For defenders of hockey fighting, scientific evidence only works in the negative sense of poking holes in anti-fighting arguments, never to defend fighting itself (sounds kind of like global warming skeptics, huh?). Do they use logic then? Well, a kind of logic, and one that relies heavily on intuition. As Simon Darnell has pointed out on this blog, there is a twisted logic in the hockey world that supports the fighting tradition. That logic has it that fighting establishes a kind of justice in the game. There’s been no lack of discussion over “the code” that determines this fighting-based justice, so I won’t go into it here, but I do want to mention one thing about “the code:” it is a form of regulation. Regulation, broadly defined, refers to any overarching entity that governs the particulars of an environment, be it business, a school district or a sport. It is generally thought of (outside of Reagan-worshipping circles) as something directed at maintaining the public good by providing a check on powerful interests, be it an oil company or a big strong power forward. And that is exactly how hockey fighting proponents see the tradition: as a positive thing that stops nice little skill players from being beaten up by big strong goons or cheap-shotters. How well does that stand up to real scrutiny? If hockey proponents were as avidly skeptical of their own position, if they questioned the use of intuition in the formation of their own opinions, and not just those in the scientifically-backed-up anti-fighting camp, how well would those opinions hold up? Or, put it this way: how well does the intuition-based fighting-as-regulation model hold up against alternative forms of regulation? Does a Bob Probert make for a better policeman than two referees and a department of player safety? Is that a serious argument? Is Don Cherry a subtle dresser? Is fighting the only way to regulate the behaviour of Brad Marchand? Brian Burke made Simon Darnell think twice about that, but I remain unconvinced. Which brings me back to my first sentence. Given that this is a regulation issue, Ralph Nader is the perfect person to discuss it. Just like business interests see little merit to, say, paying more to make sure their cars don’t unnecessarily kill people (or the planet), people who like fighting see little merit in considering alternatives. Because doesn’t it really come down to people liking fighting, just like the car companies that fought Nader’s safety activism liked the profits they claimed he threatened? The actual logic behind fighting’s support is really just in support of this primary motivation: to preserve a form of violence that people love because it has a (false) tinge of justice to it (and I’m not sure how much people even care that much about the justice part, especially given that the promise of fighting in a game translates to ticket sales for some minor league teams). So this is actually run-of-the-mill for Nader: he simply wants the NHL to regulate the pollution that is hockey fighting out of the game. To regulate the false regulators, you might say. Major Premise: In a violent game, players need protection. Minor Premise: Fighting protects players. Conclusion: Therefore, fighting should be allowed in a violent game. Major Premise: All regulation is bad for business. Minor Premise: The business sector’s success should be a society’s top priority. Conclusion: Therefore, business should not be regulated. Like sleazy politicians (is there another common kind?) the proponents of fighting rely on deductive reasoning because it’s simple and sounds airtight. The way you counter such an argument is by attacking the premises. For instance, you might counter the argument in the second syllogism by attacking the assumed premise that business interests should always trump those of others, such as public or environmental health. And in the first syllogism, you would attack the minor premise because it’s based on a myth with very little empirical evidence to back it up and very much that casts it in doubt. Based on the weakness of the pro-fighting argument, it’s hard to imagine the NHL won’t make moves to end it eventually, if not soon. The league is already making a concerted effort to regulate headshots and other dirty hits out of the game, so why would fighting, which is slowly dying anyway, in the NHL at least, be far behind? Skeptics might be able, for now, to point out weaknesses in the scientific data lining up against fighting, but how many people have to actually die or be seriously hurt as a direct result of fighting for the practice to be deemed unnecessary? Then there’s that other question the pro-fighting camp never really answers: what proof is there, even with injuries aside, that fighting ever did anyone any good in the first place? What, does it make the game more manly? Quite the intuition, that. After sleeping on this article for a night, I’ve decided a quick caveat should be added. You might counter my argument by claiming that the NHL player safety team and the referees are incapable of adequately regulating player behaviour. The same might be said of government regulation of industry. However, the burden of proof would then shift to your side, meaning that you would have to prove that the NHL is incapable of regulating in that way, or to that extent. You might argue for a hybrid system, in which the fighter doles out any punishment the league cannot (this would be the case as is, right?). In that case, however, you would have to prove that the fighter adds value to that hybrid system. In any case, to successfully argue against putting full player behaviour-based regulatory powers in the hands of the NHL (and not “the code”), it is not enough to simply point out past failures of the NHL’s regulatory system, just as it is not enough to point out instances in which government regulation is overly onerous or ridiculous. In either case, the failure of the regulator does not prove that the regulation being attempted is impossible. It might, instead, prove that the regulatory system needs reform, but that it should not be replaced or abandoned. Indeed, any form of regulation should be scrutinized constantly, but, in my opinion, that scrutiny should be bent on improving results, not disarming the referee. If no one cheers for a hockey fight, will the fight still happen? Great post, Ted. I thought Wagner did make some points about some problematic aspects of Nader’s letter (in particular, attempting to conflate concussions suffered through bodycheck or accidental contact to the head with concussions suffered from fighting) but you’re right that he implicitly defends fighting through his argument. I find the “innocent until proven guilty” defense so bizarre (i.e. we don’t KNOW that fighting is harmful to fighters’ brains so let’s wait and see). Fighting is illegal in hockey (i.e. it is penalized) and is so entirely irrelevant in the modern game that even the slightest hint that it is also damaging to the health of players should be enough to tip the scales in favour of banning it. However, the NHL appears determined to defend the status quo until it is forced to abandon it.